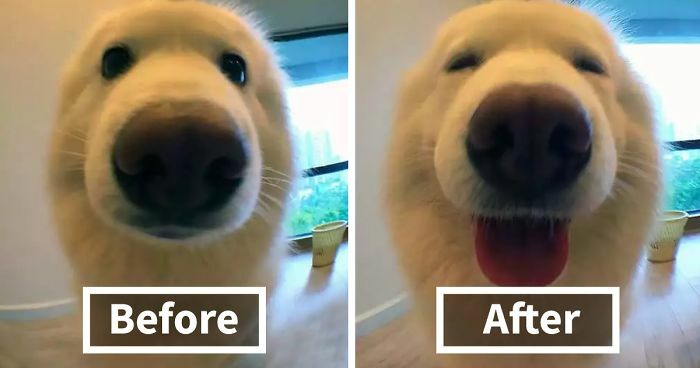 When reddit user 'JavaReallySucks' posted a pic titled "dog before and after being called a good boy" it instantly inspired others to try the same thing on their pets. The responses varied from serious attempts to just fun pictures, but what really stood out was the cats. >'. '< : "Go bother somebody else, please"
She looks like the sweetest! I`m not a good girl! #12 Before And After Being Called A Good Girl. "Take it back! I'm the DESTROYER!" #19 Before And After Being Called Good Girl. Then Really Good Girl. Then "treat?" #20 He's A Good Boy. That drool dripping down her sweet face in the second picture. Yawning really is one way cats say, "I love you." After, he doesn't care his neck doesn't fit in his shirt. #27 Before And After Being Told "good Girl!" Uummm i think i've heard that name before? Who's that again? #28 After Calling My 11 Years Old Dog A " Good Deer"
He's ready to fly the sleigh! #30 Before And After Being Called A Good Boy !! The only cat who seems to care about it. he looks like "well then, a good boy deserves a belly scratch"
#32 Walli Is Always Waiting For A Treat When He Gets Called A Good Boy! I used to have a cat named Walli. Found her in a local WalMart, this post reminded me of her. She was a good girl, too! #33 Before And After Being Told That She's A Good Girl... She Doesn't Care. Did she ruffle her tail and poop right after? #34 Before And After Being Called A Good Boy. #35 Martin... Who's A Good Boy? #38 Simone... Who's A Good Girl? I Guess Not Simone. Oohhh please spare me that..
She looks depressed, as though she doesn't think you mean it. #43 Who's A Good Girl, Mika-meeks? #44 Before And After "good Boy"
Why u speak during the best parts?! #45 "huh? Are You Talking To Me?" "FFS, spare me your bshit, hooman and leave me sleepz!" Did they say that to the dog or to the human? #52 Before And After Being Called A Good Girl. "they love me but they dont know that i peed in the bedroom"
#54 Before And After "whose A Good Bonnie?" Must Mean Kisses Time. Aww she has the most gorgeous little face <3 she looks so wise. Where is the "before" picture? This puppy is all ears! #60 Good Girl = Belly Rub! #63 Emma Before And After "shut Up, I Know It!" #65 Before And After Being Called A "good Boy"
#72 Before And After "good Kitty"
#74 Freddy Loves Being Called A Good Boy! Really? Do you love so much? Really? Even if I peed the carpet? #77 Before And After Being Told She's A Good Girl. OMG! Did you hear that? I'm a good girl!!! #79 Coco, Before And After "good Girl!" Love the little lurker in the back! #80 Before And After Being Called A "good Boy". Good enough for a tummy rub?